Jesse, an NPRA Breakfast-in-a-Bag sponsor for over 25 Elders, works for the Rosebud Sioux Tribe as the Elderly Affairs Coordinator. On South Dakota’s rural and remote Rosebud Reservation, many Elders live at or below the poverty line. Many are homebound, because of illness or because they have no means of transportation. Many are living on small social security incomes. Facing obstacles such as these, many Elders often struggle to obtain enough food to get through the month. Nutritious food and regular meals are especially important for those with diabetes, which is prevalent among Native Americans. The NPRA Breakfast-in-a-Bag service helps eligible Elders age 62 and over living on the Rosebud Reservation start each day with a healthy meal at home. NPRA also assists Elder Nutrition Centers on multiple Northern Plains reservations, which provide free hot lunches in many communities, through the NPRA Food service. Once a month, Elders can use NPRA Breakfast-in-a-Bag vouchers at reservation grocery stores to choose selected healthy items at no cost. The stores post signs indicating the products available through the breakfast service, which may include products such as eggs, sausage, bread, cereal, milk, and fruit. Genevieve, a volunteer, has been delivering NPRA Breakfast-in-a-Bag packages to homebound Elders for many years. For homebound Elders, local volunteers deliver the groceries, which also provides much-needed social visits. These caring tribal members often drive long distances over poorly maintained roads during inclement weather to reach the homes of the Elders. Many of the homes are spread out over long distances and sometimes rough roads, so it may take an entire day to reach a recipient. 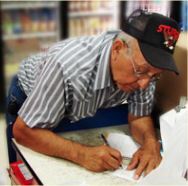 Elders sign up for the NPRA Breakfast-in-a-Bag service in January to receive groceries from February through October. The NPRA Thanksgiving and NPRA Christmas services offer special holiday fare in November and December. 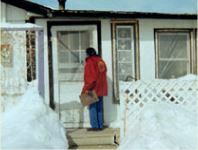 In January, we provide winter emergency food boxes to food partners for distribution to Elders. The grocery store in Mission, South Dakota, labels the wholesome foods available to Elders through the NPRA Breakfast-in-a-Bag program. Together, these services provide support and encouragement to communities that are working hard to care for their Elders. Here are a few examples of how the NPRA Breakfast-in-a-Bag program touches the lives of Lakota Elders on the Rosebud Reservation in South Dakota. "Some of our Elders live on fixed incomes. After all of their living expenses are taken care of, they don't have very much left over for groceries, so the Breakfast-in-a-Bag program comes in handy... I've heard and learned about it through my relatives. Thank you for your help."